Are nouns and verbs represented differently in the brain? A typical view is that they are, with nouns relying more on temporal cortices and verbs on frontal regions. 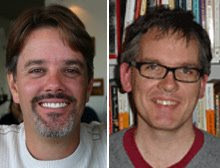 A new study in the Journal of Cognitive Neuroscience by Lolly Tyler and colleagues suggests a different view, that cortical differentiation depends on the presence of grammatical markers associated with a noun or verb, not on the noun or verb itself. Here's what they did: In an fMRI study, subjects read isolated nouns or verbs, and also read nouns or verbs presented in the context of a mini phrase that "marked" the form class of the noun/verb (e.g., a battle, you drive). As many words have both noun and verb uses (the shout was loud, I shout daily), the authors included noun-verb dominance as a parametric variation. The idea behind this manipulation is that if nouns are verbs are differentially represented in the brain, activity in these different areas should vary as a function of noun-verb dominance. The basic result was that reading the stem forms of nouns versus verbs produced no differential activation. More specifically, there were no brain areas where activity was modulated by a word's relative use (dominance) as a noun or verb. However, differential activity WAS elicited during reading of mini noun phrases compared to mini verb phrases. Mini verb phrases produced greater activation that mini noun phrases in the posterior middle temporal gyrus and superior temporal gyrus (see fig below). No regions were more active for noun phrases than verb phrases. 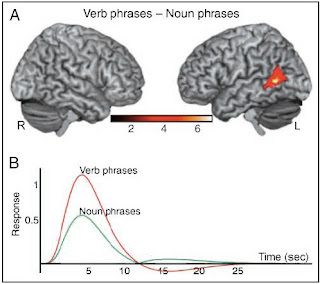 Effectively then, verb phrases (but not verbs themselves) seem to activate a superset of the regions activated by noun phrases, with the additional load of verb phrase processing being carried primarily by posterior temporal regions, not frontal regions. Tyler and company attribute the verb-phrase preferring posterior temporal activation to grammatical processing: verb phrases carry additional grammatical load compared to noun phrases and therefore draw additional grammatical processing resources. This is a reasonable interpretation, but I'm not fully convinced. We (various Hickok & Poeppel pubs) have suggested that posterior temporal regions support primarily lexical-level processes, not grammatical functions, a view that is at-odds with Tyler et al. I'm not fully convinced that we are right either (evidence isn't all that strong one way or the other), but before abandoning the idea, I think we should consider other explanations for Tyler et al. 's result. For example, mini noun phrases and mini verb phrases of the sort they used, differ in an important way. A noun phrase like the burn is basically a complete noun phrase, whereas the VP version, I burn, is incomplete; it's waiting for an additional argument, I burn toast. Maybe the posterior temporal activation reflects lexical-semantic access of possible "cloze" items: words that might finish the phrase. In any case, the really important observation from this study is that, as Tyler et al. put it, "nouns and verbs qua nouns and verbs are not represented in separate regions of the brain." p. 1386. And even when differences are found in phrasal contexts, there is no evidence that verbs are more dependent on frontal cortex and nouns more dependent on temporal cortex. I'm not sure "burn" is the best verb to illustrate the point, as it has intransitive uses as well (though the transitive use is almost certainly more common): "Double, double, toil and trouble / fire BURN and cauldron bubble." More generally, given that English has zero-conversions between nouns and verbs, and between intransitive and transitive verbs it seems like a particularly poor language to use to test the hypothesis. Right, "burn" is not the best example, but you get the idea. This may be tangential, but can you comment on research into semantic category-specific lexical deficits in anomia? Is there any good evidence, where we see naming deficits for fruits/vegetables as opposed to all else, for circumscribed damage to particular temporal lobe substructures, or for limited disruptions to some cortical network related to lexical knowledge? Could the verb-specific activations here reflect some sort of semantic categorization relating to "activity" (loosely defined)?